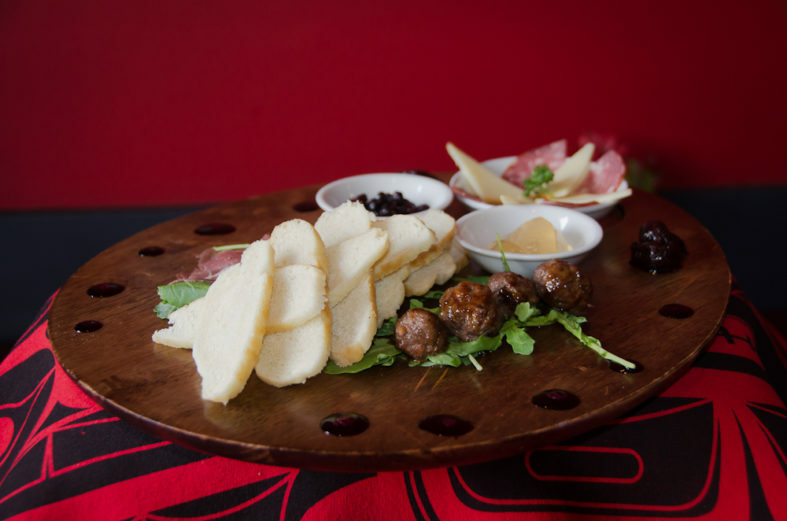 Tasting Turtle Island: Aboriginal cuisine goes mainstream. It’s Friday night in Vancouver, the last weekend of the city’s popular Dine Out Festival, and my mother and I have managed to nab a table at downtown Vancouver’s popular Salmon n’ Bannock bistro. My mom, who was raised on Canada’s northwest coast, is right at home. She has a deep affection for First Nations art and the bistro is a showcase for it. We’ve never visited before but we’re welcomed like old friends, as are other patrons, and we feast on the likes of tender elk medallions with elderberry sauce and a seafood medley accompanied by mouth-watering, spruce-flavoured wild rice. This is my most recent experience with aboriginal cuisine in Canada. Two other meals stand out. The first was during a visit to Haida Gwaii where chef Roberta Olsen laid out an unforgettable spread for her international guests: octopus, seaweed, herring roe, kelp and sea asparagus. The other dinner was served at an event at Calgary’s Hotel Arts, where Top Chef Canada finalist Rich Francis, a Gwich’in chef from the Northwest Territories, cooked up a plate that included melt-in-your-mouth salmon smoked with white sage and cedar berries. Given his high profile on Top Chef Canada, Francis has arguably helped catapult the notion of modern indigenous fare into the mainstream. But there are indications everywhere that aboriginal culinary innovators are getting their stride in kitchens countrywide. “Now is the perfect time and place for us to get this out there,” says Francis during a telephone interview; he was on a road trip to Edmonton when we spoke, but currently calls Ontario’s Six Nations Reserve home. Ben Genaille, a Cree from Manitoba who works at Spirit Ridge Vineyard Resort & Spa in Osoyoos, B.C., says the aboriginal world in Canada has been centred around survival, as opposed to the evolution of its culture. “Now, we are dusting off our culture, evolving it, and sharing it with each other and the world,” says Genaille, who has headed up the aboriginal team at the Culinary Olympics twice in Germany and who hopes to return in 2016. Back at Salmon n’ Bannock, sous chef Ryan Lalonde works closely with head chef Stacey Jones. 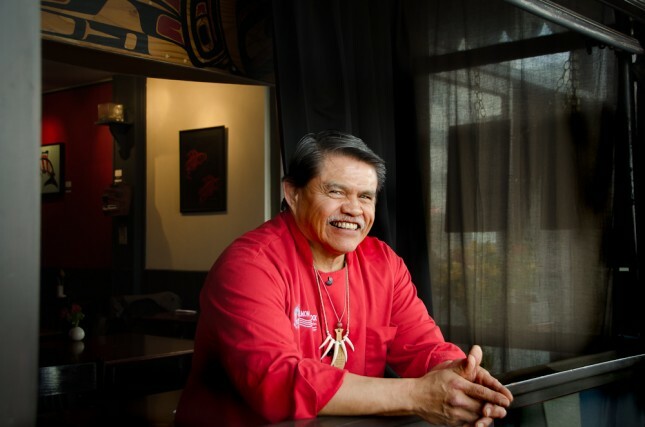 Jones is a classically trained chef who hails from Vancouver Island’s Nuu-chah-nulth community. 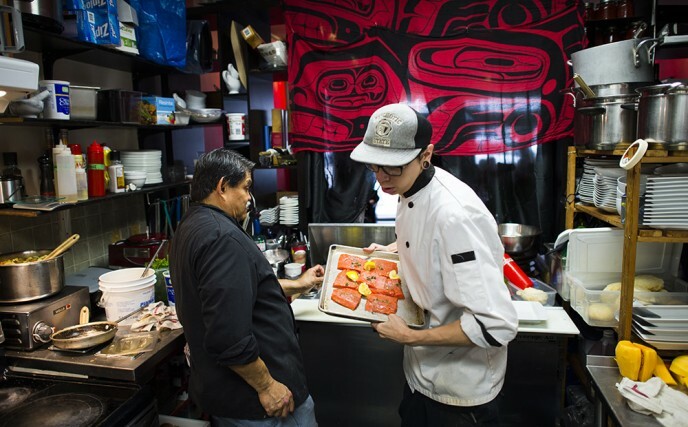 Lalonde—who was raised in foster care and is, as he says, “native by grace”—likes to put a contemporary twist on Salmon n’ Bannock’s traditional fare. Lalonde says he hopes that what’s happening in aboriginal culinary circles eventually transcends race. Inez Cook, who co-owns Salmon n’ Bannock with business partner Remi Caudron and who recently made contact with her biological relatives in the Nuxalk community of Bella Coola, B.C., insists that, in the end, her restaurant is really all about community. My mom and I wrap up our meal at Salmon n’ Bannock with hot caramel lava cake served with maple whipped cream. We practically hug the staff goodbye as we leave. 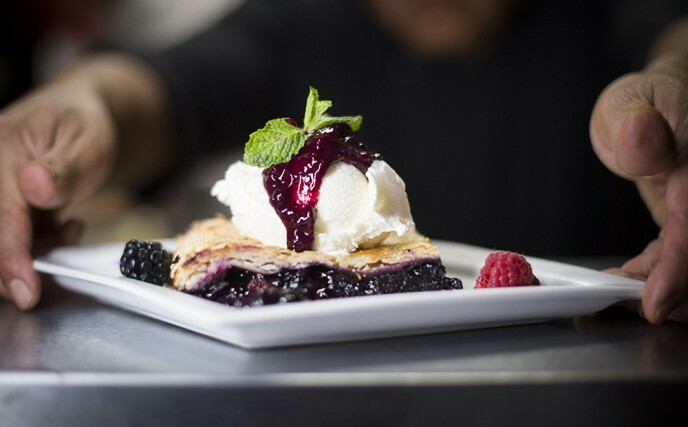 Of course, when we hear later that this cozy, unpretentious bistro downtown Vancouver has won the city’s Dine Out Festival award for “Best Dining Experience”—we’re hardly surprised. *Note from Editor: This is the first story in a series that we’re creating in an arms length collaboration with Aboriginal Tourism British Columbia. This post was not reviewed or edited before publication. My experience at salmon & bannock, was my best dining out experience. The service and amazing menu had me talking about it to all my friends. I can’t wait to go back and try another amazing dish.